Following his boxing victory over middleweight champion Danny Wheeler, Adonis “Donnie” Creed (Michael B. Jordan) continues his path through the ranks of world boxing. When he reaches the height of the sport – world heavyweight champion – an unexpected challenger emerges. Viktor Drago is the son of Ivan Drago (Dolph Lundgren), the former boxer who back in 1985 killed Donnie’s father Apollo in the ring. Driven to take the younger Drago on, Donnie faces another hurdle when his trainer Rocky Balboa (Sylvester Stallone) refuses to help. The Rocky saga now seems unassailable as the greatest film character study in history. Starting with Rocky in 1976, it has followed boxer-turned-trainer Rocky Balboa through essentially seven sequels as its protagonist has aged, matured and grown. It remains Stallone’s best role. He wrote it for himself when Hollywood failed to provide any themselves, and is the best acting and script-writing work he has done. For the last two instalments the focus has shifted from Balboa to newcomer Adonis Creed, but Rocky has remained in a key supporting role. He is always hugely welcome. Creed II follows the model of the early Rocky sequels very closely. It begins with its protagonist at the top of his world, rich in both money and reputation. It then presents a challenger capable of bringing that world crashing down, and leaving the hero to redeem himself over the remainder of the film. There are not any surprises here: if you’ve seen a Rocky sequel you know almost exactly how Creed II is going to play out, beat for beat. Twists and turns are, after all, not a key part of the franchise. Emotional effect most certainly is. 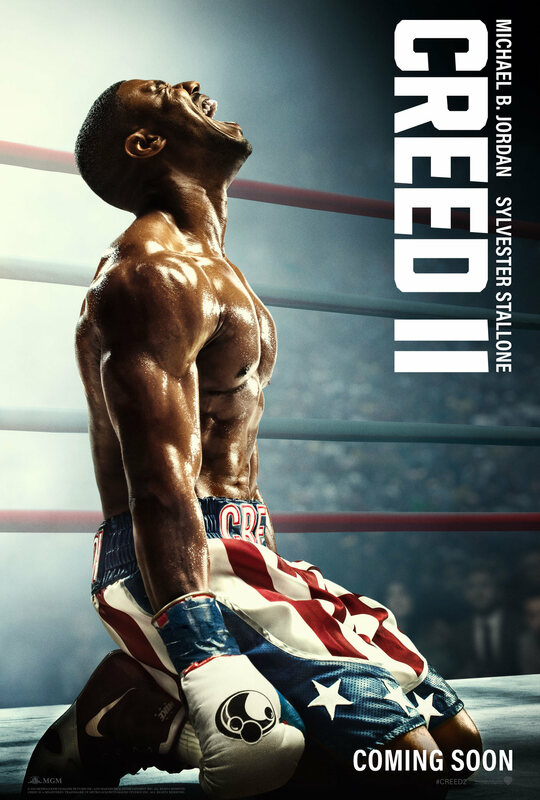 There is a warm catharsis to Creed II and a satisfying focus on seeing much-loved characters another time. They’re a little older, and they have changed a little too. The film’s technical qualities are superb, however the greatest satisfaction comes from strong performances across the cast. Everybody is in top form. Michael B. Jordan gives Donnie a sharp combination of vulnerability and bravado, Tessa Thompson continues to give Donnie’s girlfriend Bianca depth and strength that goes beyond the script, and Sylvester Stallone – taking slightly more of a back seat this time – is a perennial diamond shining through the story. He is always a pleasure to see; indeed, I would claim his is the finest act of long-term acting in film history. Other actors have returned to a role multiple times over a period of years, but none have managed to achieve quite as much depth and development. This eighth time around it feels that there is a definitive passing of the torch from Rocky to Creed. Any future films can easily further Donnie’s story over Rocky’s. It feels like an end, and that ending feels right. The film’s absolute highlight is Dolph Lundgren. Back in Rocky IV Ivan Drago felt like a cartoon. He was the villain of an exaggerated and near-comical film, lacking any kind of complexity or personality. Lundgren had the look and the build for the part, but all that part asked was a muscular physique and an ability to box. Here he is able to deliver something much richer and engaging, with an emotional purpose and real relationships with other characters. This is his best chance yet to demonstrate his acting abilities, and he delivers a remarkably strong and watchable performance. It takes a comparatively straight-forward sequel and turns into something special. I really hope other film productions take notice and give Lundgren the late career renaissance he deserves. The door ends up wide open for a third Creed, indeed it even reveals a path to a tangential Drago spin-off as well were MGM so inclined. In all fairness the latter seems unlikely; the former seems one of the safest bets in American film. That at least makes me happy. Earlier this year FictionMachine took an extended look at the first Creed film. You can read that essay here.